Mike Newton-Woof at Ventura gets in touch with news of a €1 million price reduction on the 26m Riva motor yacht Fresca, a joint listing with Egyptian brokerage Synergy. 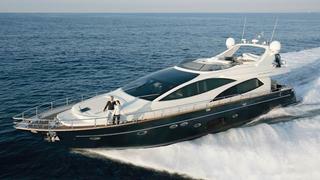 Built by the Italian yard in 2008, Fresca is part of their successful 85′ Opera Super range of flybridge motor yachts. She has four en-suite staterooms on the lower deck, including a full beam master that benefits from large-hull windows which flood the cabin with natural light, making it an oasis to relax and sleep. Fresca is down from €3.9 million to €2.9 million.